The forgotten super fruit of the USA: Montmorency Tart Cherries. The animation below was created for Montmorency Tart Cherry’s social channels, celebrating the story of Montmorency Tart Cherry’s heritage. This was one of my favorite projects to work on, from concepting the idea, designing mood boards, storyboarding, and creating the final assets. 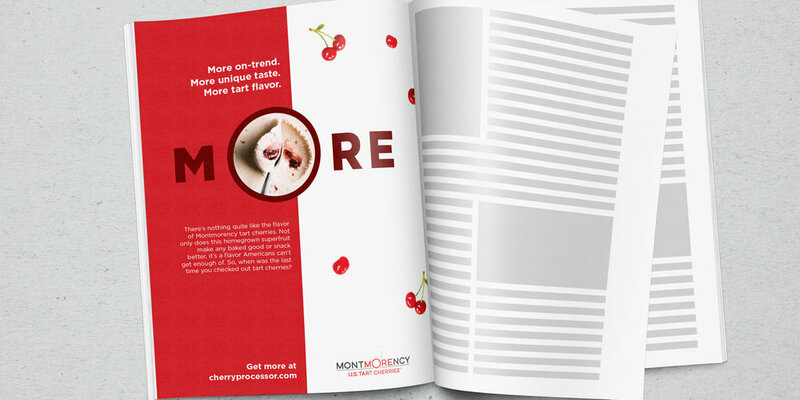 Montmorency Tart Cherries needed a little “life” breathed into their trade ads. Something that would visually grab the attention of ingredient decision makers, but also tell the story of America’s home-grown superfruit - including its health benefits, trending tart flavor, and availability year-round. The bold color choices, typography and photography ensure they stand out visually, while the copy communicates all points of their key messaging in a concise and clever way.